If you read my posts regularly, you know that I’m a fan of Lambert, Hendricks and Ross, the great jazz vocal group that influenced so many others, from the Swingle Singers to New York Voices to their most successful progeny, The Manhattan Transfer. Hard as it is to believe, the trio of Dave Lambert, Jon Hendricks and Annie Ross only recorded together for five years (1957 – 1962). Unlike many others, I’m even quite fond of the work of Lambert and Hendricks with Yolande Bavan, the Ceylonese soprano who replaced Ms. Ross in 1962 and recorded three albums with the group for RCA. Dave Lambert’s untimely death in an accident on a Connecticut highway in 1966, put an end to the talk of the original trio’s reunion that had been buzzing at the time. There’s a handful of film footage of both of the group’s incarnations, in qualities that range from grainy but historically relevant; to clear, fun and eminently watchable. And until recently, I thought that I had seen pretty much all that was publicly available. Then a few months ago, I stumbled upon something that had been hiding in plain sight for many years – a short film from 1964, by D.A. Pennebaker, who would go on to create some of the best rock documentaries ever made. 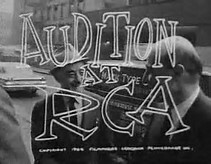 It was called simply, Audition at RCA. It features a post L, H & R (or B) Dave Lambert, as he has formed a new group, called Dave Lambert and Co., as he is trying to convince the suits at RCA Records, who had last recorded Lambert, Hendricks and Bavan; to give one more shot to the art form known as vocalese. In the documentary, you not only see and hear Lambert as he works through “the process” but there’s also legendary jazz producer George Avakian (who was ready to produce the album if RCA signed on) and the great bassist George Duvivier among those providing musical support. The quartet of vocalists supporting Lambert, were all unknown and although they were quite capable, none went on to very prominent careers in the jazz world. The tunes are catchy, especially “Blow The Man Down” and “Comfy Cozy” (which sounds tailor-made for L, H & R). I would have liked to have heard what the finished product sounded like. Unfortunately, it was not to be, as the RCA execs didn’t go for the project. The tapes of the music were erased and this cool, swinging music by a jazz master, ceased to exist anywhere, except for the snippets that are a part of this documentary short. To my knowledge these tunes have never been recorded again and I’m not sure if any complete, written versions of the compositions and arrangements exist. If they do, what a great project it would be to finally let them be heard, more than half a century later.